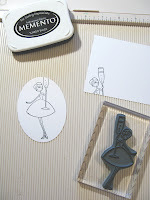 This My Favorite Things stamp set is a classic for New Year's, in my book. 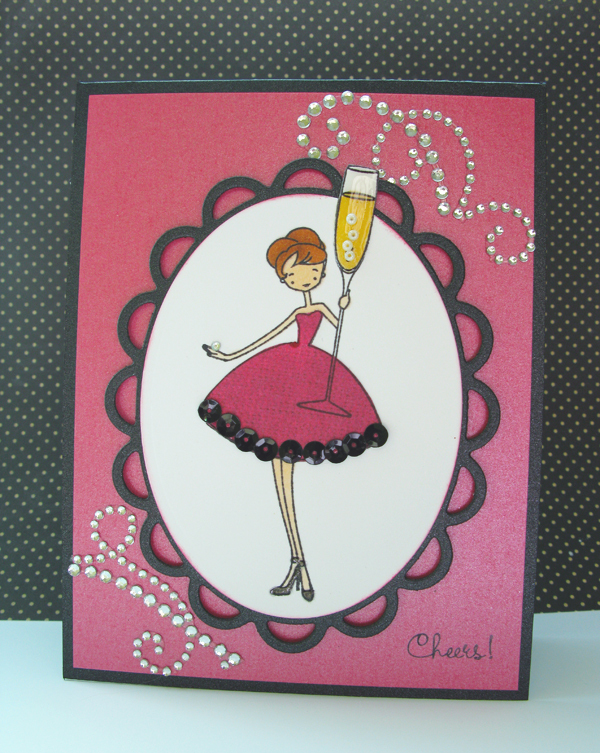 I wanted to use some items that would make this card stand out, give it some texture and depth, so I gathered sequins and beads and rhinestones -- things you might find on that beautiful cocktail dress you're wearing next weekend to a New Year's party. The pretty lady needed to be the focal point so I stamped her on Neenah Classic Crest in Solar White and then cut the paper into an oval with a Spellbinders Classic Oval die. 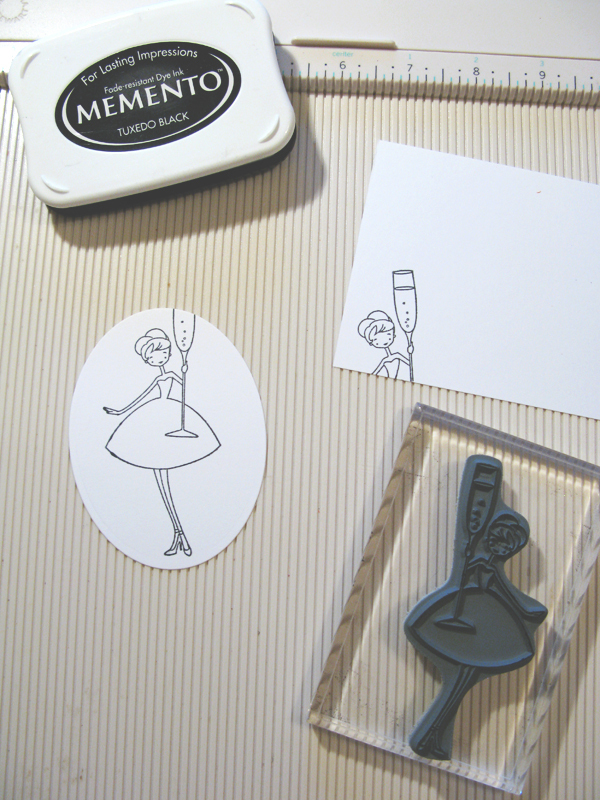 The champagne flute didn't quite make it (I meant to do that), so I stamped the flute again, colored it with Copic markers, cut only the cup portion, put a layer of Glossy Accents over it, and finally adhered it on top of the stamped glass on my oval. For a little more fun, I added a few tiny white seed beads to represent bubbles! I colored the lady's hair, skin and shoes with Copics and then added a touch more Glossy Accents to her shoes to make them look like patent leather. Next I stamped the image onto a piece of Basic Grey patterned paper from their Lauderdale line and cut out just the dress, layering it on top of the dress already on the oval. 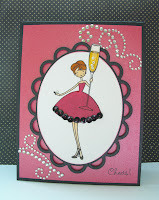 I then put a thin line of Tombow wet adhesive onto the hem of her dress and added some shiny black sequins! So chic! To put the whole sparkly vignette together onto a sparkly black card, I cut a 4" x 5.25" piece of sparkly hot pink cardstock for the card front and added pieces of a Zva Creative crystal flourish onto the upper and lower corners. I added one tiny bling onto the lady's hand as a diamond ring! The oval piece is edged with a bit of ink and then mounted onto a die cut Lacey Oval from Spellbinders. This piece was mounted to the card front with foam tape for dimension. 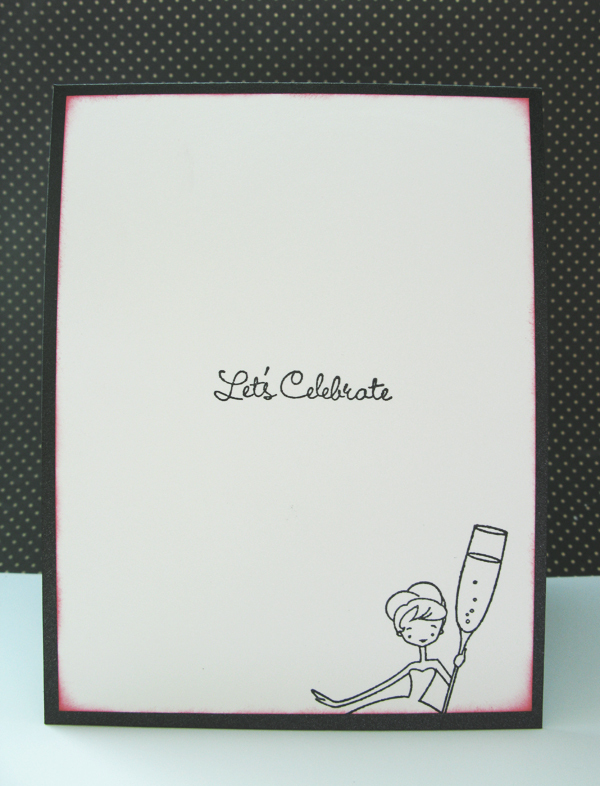 As a finishing touch to the card front I stamped "Cheers!" in the lower right corner. Inside is a simple sentiment and I stamped the lady's upper body and champagne glass again in the lower right as well. May 2012 bring you lots of crafty happiness! Very pretty! Love that raised glass!